Urban infrastructure in Turkey connects people, things and ideas in sometimes controversial ways: the grand construction of third Bosphorus bridge is one highly visible example. This paper, however, considers a feat of urban infrastructure that you can hold in the palm of your hand: an emergency button allowing elders to reach a central call center. A few urban Turkish municipalities have distributed these buttons as part of social projects to care for their older constituents, but this has left some elders in districts without the program extremely dissatisfied. Through the story of a 93-year-old resident of a large AK Party municipality in Istanbul and a municipal official who had not yet been able to deliver on her promise of the button, I provide a glimpse of the micro-relations, affective connections and municipal politics that propel a specific infrastructural project. Affective relations among residents and officials do not unfold in the shadow of infrastructural projects large and small, but help form the conditions of their possibility. 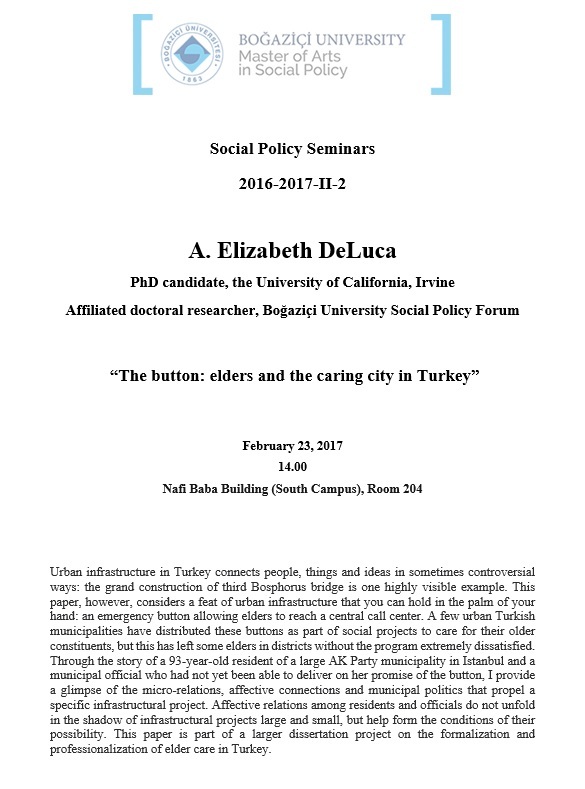 This paper is part of a larger dissertation project on the formalization and professionalization of elder care in Turkey. A. Elizabeth DeLuca is a PhD Candidate in Anthropology at the University of California, Irvine with a specialization in Anthropologies of Medicine, Science, and Technology. Currently conducting dissertation research municipal elder care programs in Istanbul and Eskisehir, Turkey, her research is funded by fellowships from Fulbright-Hays Doctoral Dissertation Research Abroad and the National Science Foundation Doctoral Dissertation Improvement Grant. She is also a Visiting Researcher at Boğaziçi University's Social Policy Forum. Her research interests include knowledge formation, the politics and ethics of care, and kinship and citizenship. She has received an MA in Social Science from the University of Chicago (2012) and BAs in International Relations and Women's Studies from Michigan State University (2006). Her previous work has explored intergenerational relations and forms of national belonging in the context of Crimean Tatar language revitalization in Ukraine. Social Policy Seminars are designed to bring together influential or promising researchers in social policy and the Boğaziçi University community to discuss current issues and up-to-date research findings in the field. Seminars are organised as part of the Graduate Seminar course leading to a Master of Arts degree in Social Policy. All members of the Boğaziçi University community are welcome to attend.